Here’s a quick code snippet to remove version numbers so you can optimize your website. This helps with page speed scores from Pingdom, GT Analytics and Google Page Speed. And it really not needed until you make changes again. 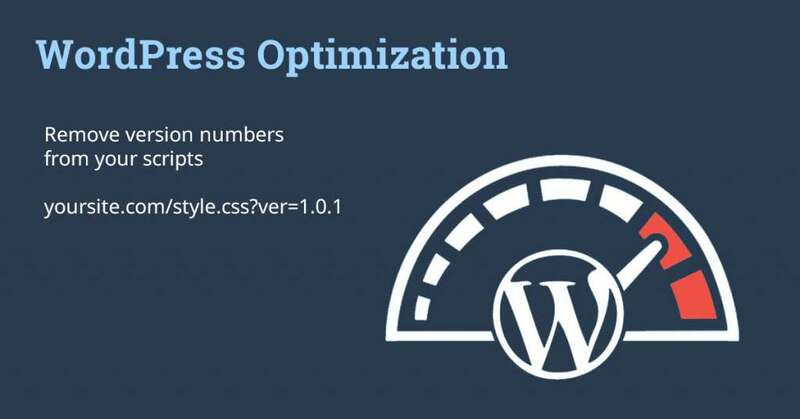 Optimization is an important step after you’ve launched your new WordPress website. After development of all CSS and JS, there’s typically no need to include versioning of your CSS and JS files. Use version numbers when you send updates to clients. At this point, you’ll have to use developer jargon: “The CSS is cached in your browser. Go back to the page and hard refresh and see if that works.” Whether it works or if the browser is keeping the cache for another 2 weeks, the client is now crossed eyed and annoyed. Clients just want it done right the first time. Save sanity by using version numbers during development and client updates. Increase page speed by removing version numbers when you plan for the scripts to sit for awhile.